If you want to learn Calculus, the websites below will most likely help to you. Most of these websites contain conceptual and intuitive explanations of Calculus concepts and most of them are interactive. In the previous post in this series, we have learned about asymptotes. horizontal asymptote and vertical asymptote. We continue this series by discussing oblique asymptotes in this post. Notice that as goes to infinity, the remainder goes to 0. The expression is the oblique asymptote. 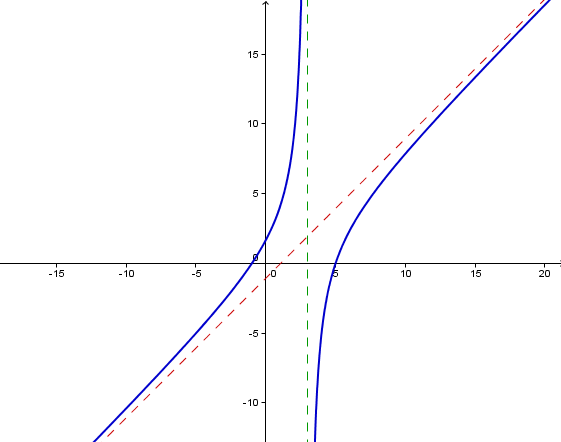 The red dashed line in the graph is the oblique asymptote of the function above. Notice that the function has also a vertical asymptote (see green dashed line) which is . Note however, that if the degree of the numerator of the rational function is more than the degree of the denominator, but not 1, there are no oblique asymptotes. In addition, there is at most one oblique asymptote or one horizontal asymptote, but not both (Why?). Almost a year ago, I bought Mr. Bob Miller’s Calc for the Clueless series for a younger cousin (I, II, and III), and she returned the book to me after finishing her Calculus class. Last week, I started reading Calc for the Clueless: Calc I and found it to be very student friendly. Most examples are easy to follow, and the book contains practical tips in solving problems. The book has also a chapter solely dedicated to worked out maxima and minima problems. What stands out in Calc for the Clueless: Calc I is its chapter on Curve Sketching. The author has detailed the methods of basic curve sketching and explained clearly the roles of intercepts, asymptotes, and the test for round minimums and maximums. There are a lot of step by step tutorials on sketching polynomial and rational functions. Overall, I think Calc for the Clueless: Calc I is a good companion book for students who want to learn self study Calculus especially those who are non mathematics majors.